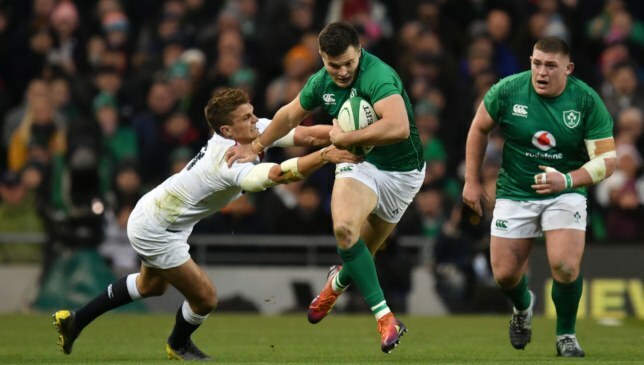 Jacob Stockdale says Ireland remain a work in progress. 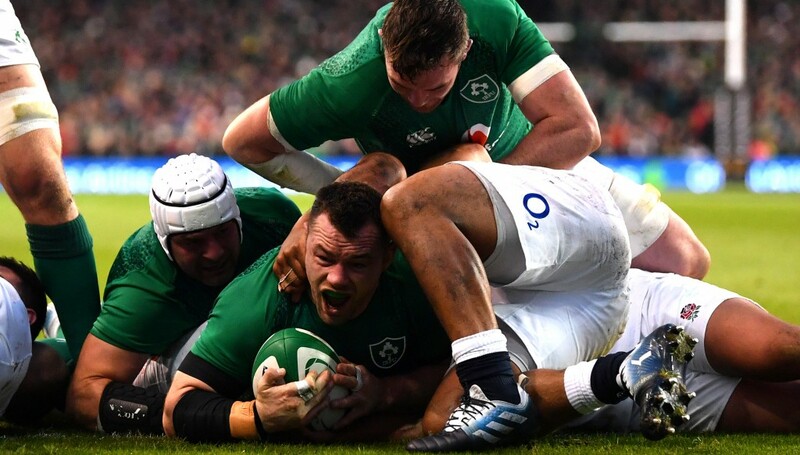 Stockdale had enjoyed a near-fairytale Test career until Saturday’s 32-20 Six Nations loss to England, where the stunning form that carried Ireland to last year’s Grand Slam and a victory over New Zealand came to an abrupt halt. “So we’re still trying to work and still trying to improve. You learn probably more from losing than you do winning. For me personally that’s a massive point – I don’t want that to ever happen again. “Daly’s try where I tried to collect it and it bounced out of my hands, I was really disappointed with that. I felt like I could have collected it and obviously stopped that try. 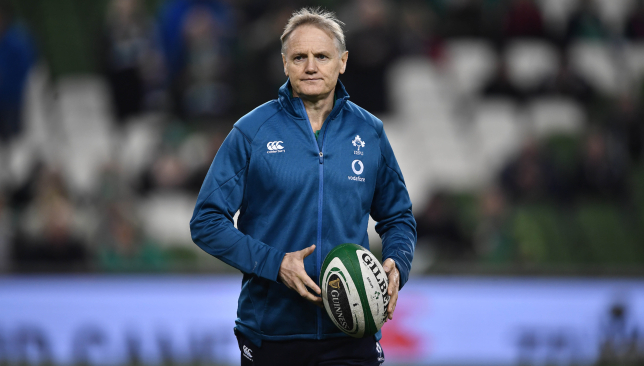 Joe Schmidt has hit back at critics of his tactics by insisting Ireland boast a “very varied game” despite their comprehensive Six Nations loss to England. A host of pundits accused Ireland of lacking a Plan B in the wake of last weekend’s 32-20 physical battering at the hands of England. But Schmidt has moved to defend his approach ahead of their trip to Murrayfield to face Scotland on Saturday. “I’d like to see how they’d describe our Plan A to be honest,” said head coach Schmidt, responding to accusations Ireland’s gameplan is limited. Munster’s Chris Farrell will make his first Test start in almost a year when Ireland face Scotland this weekend, with Robbie Henshaw ruled out through a dead leg. 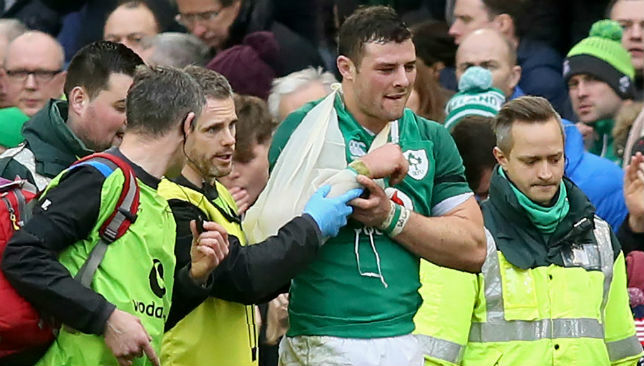 Robbie Henshaw is ruled out of the Scotland clash. Rob Kearney has returned at full-back after the experiment of moving Henshaw to 15 to face England failed amid Ireland’s heavy defeat in Dublin. Quinn Roux will partner James Ryan at lock, with Devin Toner having joined Iain Henderson and Tadhg Beirne on the injury list. Henshaw’s injury blow, coupled with Garry Ringrose’s hamstring problem, has opened the door for Munster’s battering-ram centre Farrell to win his fourth cap. Farrell has struggled with a string of knee injuries since his last Test appearance, a man of the match showing in Ireland’s 37-27 Six Nations victory over Wales in February 2018. “Robbie has a dead leg and just hasn’t recovered in time,” said Schmidt. “It’s just a bit of aggravation after having a knock. It’s a knock on top of a knock. Ireland have to recover quickly this weekend against Scotland. When asked if Kearney would have returned at full-back even had Henshaw been fit, Schmidt added: “Probably once Garry Ringrose was ruled out it was going to be trying to keep a little continuity as best we can and get as cohesive as we can in a short space of time. “You’ve got Chris Farrell sitting in the wings, massively motivated to do his best. So it’s a great opportunity to get him in and give him a run. Scotland players congratulate Blair Kinghorn who scored a hat-trick for the Dark Blues against Italy last weekend. 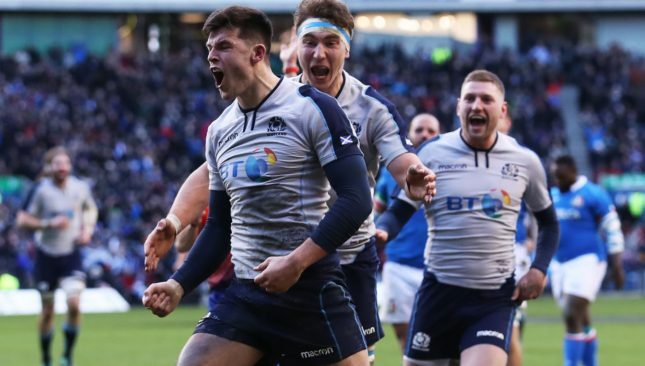 Scott Hastings feels Scotland remain a work in progress under coach Gregor Townsend and while they are definitely on an upward curve, the elite Six Nations teams will have done their research on the resurgent Dark Blues ahead of 2019. Scottish rugby, at least at the international level, had been dwelling in the doldrums in recent years – they were handed the Six Nations wooden spoon as recently as 2015. Bar perennial strugglers Italy, the Scots have finished bottom of the championship in its revamped format more times – four – than any other nation since the Six Nations was established 20 years ago in 2000. However, former fly-half Townsend took over in May 2017 and in last year’s Six Nations – buoyed by a stunning 53-24 destruction of Australia in the 2017 end of year autumn internationals – Scotland rose to finish third behind champions Ireland and Wales in second place. It was the highest Scotland had finished since 2013, while 1999 was the last time they won the tournament (the final year of the Five Nations). Scott Hastings won 64 caps for Scotland and played twice for the British & Irish Lions. They began brightly with a thundering 33-20 triumph at Murrayfield over Italy on opening weekend last week, but welcome wounded Ireland on Saturday. And after building steadily in the last two years, 64-times capped centre Hastings is glad to see that Townsend has finally married attacking players and rugby together. “It was an alright autumn,” Hastings said bluntly having seen Scotland lose 21-10 to Wales and narrowly 26-20 to South Africa as well as beating Fiji and Argentina at the end of last year. “Scotland are a work in progress under Gregor but what I think everyone understands is they play a very attacking brand of rugby, they have some brilliant ball attacking players in Stuart Hogg, Sean Maitland, Huw Jones, Finn Russell and then the experience with Greig Laidlaw. “In the pack there’s competition there with Stuart McInally, WP Nell, in the second row Jonny Gray, Grant Gilchrist, Ben Toolis who are building up an understanding. Jamie Ritchie’s come into the back row – that’s been one of Gregor’s traits as coach, bringing in the youngsters. Hastings though, who along with elder brother Gavin, also featured for the British & Irish Lions, making one appearance on both the 1989 and 1993 tours to Australia and New Zealand respectively, feels the elite teams will still trouble them. 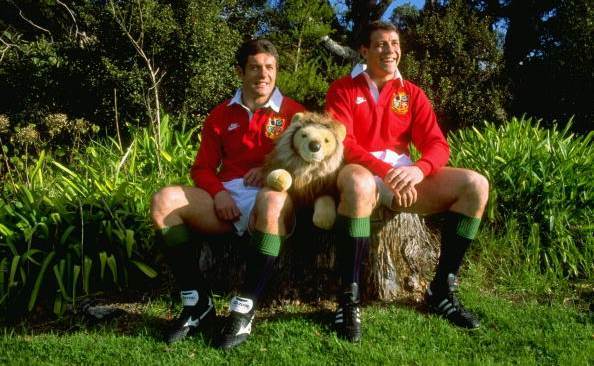 Scott Hastings (r) pictured with brother Gavin ahead of a British & Irish Lions tour. 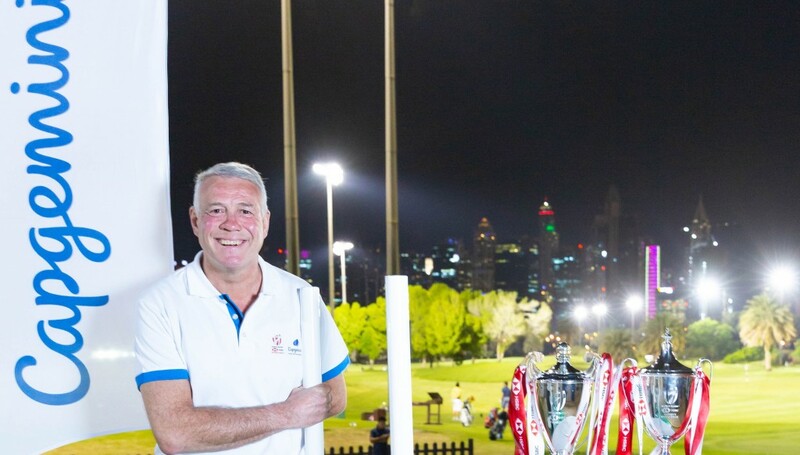 “However, against a well organised defence or physical set of players like South Africa or Wales, they challenge Scotland in ruck ball and contact,” added Hastings, 54, speaking to Sport360 during December’s Dubai Rugby Sevens in his ambassadorial role with Capgemini. “If Scotland don’t get quick ball they’re quickly found out so going into the Six Nations and Rugby World Cup they’re behind the other sides in terms of being competitive and grinding out results. “They’re close but not quite there yet. I think you’ll see them try and cope with that physically over the top of the ball but also attacking the ball with this high tempo game. One thing you fear in sport is speed and they will worry defences with their high tempo game. “A lot more teams will know about them this year though, absolutely. They’ll be analysed from last year and the autumn and the teams that work them out defensively can really suffocate them. “Wales with Justin Tipuric and Alun-Wyn Jones, the dominance of those players in that pack; England have found their mojo again and Joe Schmidt, with his knarly set of Irish forwards and huge experience at half-back who drive this green machine to more and more success. Looking ahead to the World Cup later this year, and it would appear the Scots are well positioned to make further strides towards the top teams, and build on their controversial exit four years ago in England when they were downed 35-34 by the Wallabies in the quarter-finals thanks to some contentious refereeing. In Japan, Scotland face a kind pool, with Joe Schmidt’s Ireland in their midst. But in a group also containing the Brave Blossoms, Russia and Samoa, Townsend’s troops will be favourites to finish second and are facing a likely quarter-final with world champions New Zealand if that scenario unfolds. But with England, Ireland and Wales all being touted for Six Nations success and with the All Blacks not at their imperious best, while the Springboks are rebuilding and Australia in a mess, Hastings is looking forward to one of the most open World Cups in years. BREAKING | Scotland make four changes for this Saturday’s Guinness Six Nations clash with Ireland @BTMurrayfield. 🔄 Berghan and Strauss replace injured Nel and Skinner, Gray & Maitland return from injury for Toolis and Kinghorn who move to the bench. “I think Scotland are in with a chance, absolutely,” said former outside centre Hastings, who played for his country between 1986 and 1997. “The thing is with the World Cup and Scotland, you lose that first game and you’re suddenly under pressure to win all your remaining games, and come up against the hosts in last pool match. “If they cause an upset by beating Ireland they still have that tricky game v Japan. Once you get to the knockouts in a World Cup though, anything can happen. “The Australia game four years ago, they contrived to lose, with poor decisions to close out the game. They were moments from being in a semi-final. Australia are on the ropes now and I think it’s exciting and the World Cup will be very exciting.